The Espresso Room is a great little coffee bar in the centre of London, which prides itself on a wide variety of guest coffees. Although I have recently become a bit of a coffee snob – I won’t stand for those massive cups of hot milk they try to fob you off with at the big coffee chains – I am not yet a fully fledged arabica aficionado. And as such I can’t recommend any specific blends. I just ask for a flat white and it always tastes delicious. The café is decked out with an assortment of second-hand wooden tables and chairs. 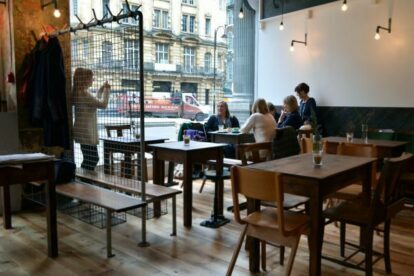 The décor is fairly understated but nice touches such as filament light bulbs and a meshed fence coat hanger give the space a little bit of character. The Espresso Room has a great location just across the road from Holborn station. I usually stop by for a coffee after visiting nearby attractions such as Sir John Soane’s Museum or the British Museum.